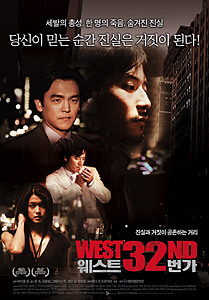 West 32nd (Director: Michael Kang): John Cho (Harold from Harold and Kumar Go To White Castle) plays John Kim, an ambitious young lawyer who offers to represent a Korean teenager accused of a gang-related murder in New York’s Koreatown. His firm wants to raise its profile and he feels by doing this pro bono work, he can advance his career as well. His own Korean background helps convince the boy’s family to sign on, but in reality, he doesn’t even speak the language. Before he knows it, he’s caught up in an underworld he didn’t even know existed. He meets Mike (Jun Sung Kim), a mid-level gangster trying to move up in the hierarchy, and the two quickly recognize each other’s ambition and begin an uneasy cooperation. But John is soon over his head in a culture he doesn’t really understand, and before long, there are more dead bodies and he’s no closer to winning his case. By the end of the film, any hint of altruism in John’s offer to help is peeled away to reveal that he’s really not that different from the gangsters he’s trying to bring down. Though Cho is effective as John Kim, it was Jun Sung Kim’s character Mike Juhn who really lit up the screen for me. Unfortunately, the female characters seemed largely decorative, but that seems to be part and parcel of the traditional Korean culture that runs these criminal organizations. The locations in Manhattan and in Flushing, Queens added to the gritty realism of the film, and Kang used many actual Korean-American denizens of the neighbourhoods to further boost the authenticity factor. Kang has made a slick and effective thriller that, while not particularly original, pays homage to both the American gangster films of the 70s and the more recent wave of Korean crime films. His co-writer is Edmund Lee, a former Village Voice reporter who spent years thoroughly researching gangs and organized crime in New York’s Korean community. As Kang described the project, he started out trying to make a Korean-American version of The Departed and ended up with something more like Mean Streets. This entry was posted in Film Festivals, Reel Asian and tagged #reelasian08, crime, gangsters, korea, newyorkcity, nyc. Bookmark the permalink.